Hurraw Natural Lipbalm SPF15 Sun Lipbalm moisturizes and protects your lips from the sun ! Its natural formula with zinc oxide provides a physical barrier against UVA and UVB rays. Its formula rich in organic oils and butters made from premium raw, protects and nourishes. Your lips are smooth and moisturized with its natural delicate fragrance. All the Hurraw Lip Stick Balms are 100% natural, vegan (no animal-derived ingredient) and crueltyfree (not tested on animals). Handcrafted production, the quality of cold pressed oils and raw butters is superb : you will see the difference ! 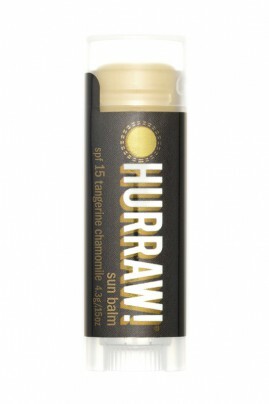 We love the sun, we love HURRAW Sun Lipbalm ! You really only need one or two swipes of Hurraw Sun balm for protection, many swipes will indeed give your lips a white tint ! Due to the herbal extracts and zinc (mineral) constitutions we use in the Sun Balm, variations in color may occur and is normal. Hurraw Vegan Sun Protection Lip Balm will give your lips the extra protection they need !